Essential oils do not have to be complicated or confusing. 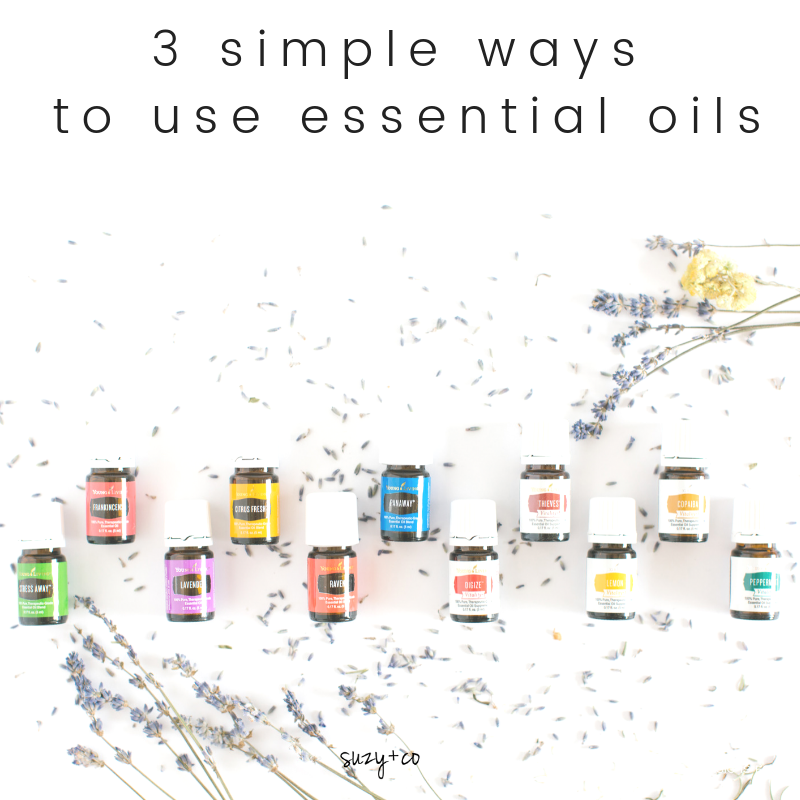 In fact, using essential oils in your life every day can be very simple. You just need a guide to help you get in to the oily groove. 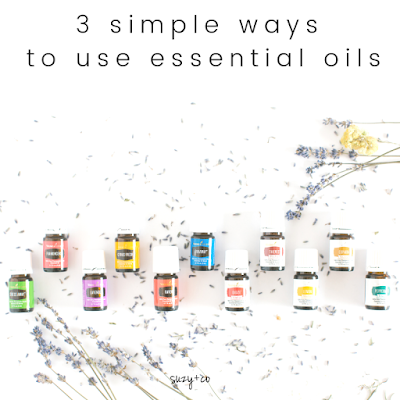 There are three ways to use essential oils - aromatically, topically, and internally. That's it. Already I bet it seems doable. There are no fancy recipes to have to memorize, no crazy measuring, and no special equipment. You can get started using them right away. 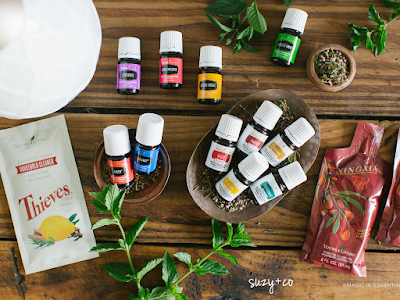 Note: I only use Young Living essential oils and I am not at all afraid to say I am biased! When a company lets you plant and harvest the plants that will be distilled into oils, (YES, I DID THAT) when they are transparent about income (I'm a silver), when they have the highest quality assurances, you will be biased too. Aromatically is simply smelling the oils. There are a few ways to do this. This is the most gentle way to use essential oils. Diffusing essential oils is great because they purify and cleanse the air from environmental impurities. Harsh chemical formulas aren’t your only home cleansing option. You can have peace of mind without compromise when diffusing Young Living Essential Oils. So not only are you making your home smell absolutely amazing, you aren’t damaging your health like those other fragrant sprays, candles and plug-ins may be. Why use essential oils topically - on your skin? It is said that the average woman applies over 300 chemicals to her body daily, most before breakfast. It would be so much better for your skin, your body and your health to have natural products going on your skin. Ones that are helpful and healthful and not potentially hurting you. Essential oils molecular size are smaller than cells, which allows oils to penetrate your skin very quickly. Your skin is your largest organ you have. Everything that touches you skin, your shampoo, your deodorant, your make-up, your lotion, is directly absorbed into the bloodstream, which then carries those toxins to your organs. Most people when they think of getting healthy, they just solely focus on their diet and adding in exercise. Which yes, that is very important, but in all actuality, what you should also be more concerned about is what is coming in contact with your skin. Because when you ingest something orally, it at least goes through a filter and gets broken down by enzymes and flushed out of the body to a certain extent. People think that the skin is a barrier, when it is really a carrier. To use oils topically, each bottle will tell you if you can use it as is, or if you should dilute it. When you dilute it, use a another oil, a carrier oil. Carrier oils can be olive oil, jojoba oil, avocado oil, grapeseed oil, etc. I like avocado. Then I can cook with it and use it with essential oils and I don't need to have tons of bottles in my house! The idea of “if a little is good, a lot is better” is not always correct. Essential oils are very potent and powerful, so start low and go slow. In most cases 1-2 drops are adequate and using more may waste product. Depending on the essential oil, you can gradually build up to 3-4 uses per day if desired. Depending on what you are using the oil for will depend on where you put it on your body. for more education on location, email me at suzy(at)suzyandco.com or find me on Instagram. There are charts as well when using essential oils for children. Please contact me directly if you are interested in more education on children and essential oils. There is a lot of confusion around this. First and foremost - do not take any oils internally unless you have researched the company and trust the product they are putting out. You may see recipes with essential oils or suggestions on ones to add to your water. You might think you would like to try it, but just want to go to a local store and pick up any brand. Nope, no, nope, uh uh, no way, nope, don't do it. Please! There is a difference. When you seed the word pure on a label, it does not actually mean that there is only oil in that bottle, it just means that the oil they did add happened to be pure. There could be other things in there. Again, I only trust Young Living. But do your own research - call companies, visit their farms, visit their distilleries. If you do decide to take oils internally, follow the label on the bottles. Heating essential oils to a higher heat will negate the therapeutic benefits of them. A great way to keep the benefits but still use them in cooking is to making dressings and dipping sauces. Within each category - aromatically, topically, internally - there are so many ways they can support your body, support your systems, and support your wellbeing. You can start your wellness journey now and have all the wonderful bottles of oil through the holiday season! Don't wait until the New Year, to put your health first. You can order your simple diffuser kit here. When you order from me I will provide you with resources and one-on-one mentoring so that you will feel comfortable using your new kit. You'll get a diffuser, 11 oils, samples of a wellness drink, and a sample of Thieves all natural cleaner that you can use to clean all the surfaces in your house chemical free and for pennies per ounce.